Looking back, I realize I was lucky to have had that pain in my arm. It had come on slowly, but it increased relentlessly over the course of the first year, and when I was no longer able to pick up a glass of water, I went to the doctor. After examining me, he said that habitual positioning and repetitious action were creating and holding tension in my muscles, putting them into spasm. He explained that when the muscles were in spasm ordinary movements created friction and excessive wear and tear on the joint. He told me that what I was experiencing was the beginning of osteoarthritis. Looking back, I realize I was lucky to have had that pain in my arm. Arthritis literally means inflammation of the joints. There are many types. Osteoarthritis, the type confronting me, is known as the “wear and tear” variety. It is by far the most common kind of arthritis and is often considered a natural part of aging. Eighty-five percent of the elderly in America have osteoarthritis. It is usually diagnosed by examination and patient information, or by the clouded joint spaces, bone erosion, and calcium deposits seen on X-rays. While it affects the bones, osteoarthritis often begins with the muscles. Our bodies are able to move because the muscles contract and relax, flexing and extending our joints. These same contractions and relaxations also generate the circulation of blood that maintains healthy joint function. With each relaxation a fresh supply of blood, rich with nutrients and vital to muscle metabolism, is carried into the cells. Every contraction squeezes the old blood out of the muscle cells, removing the waste products of cellular metabolism. When muscles spasm, bloodflow is reduced, trapping these waste products in the cells, and it is this lack of circulation with its corresponding build-up of toxins that can lead to inflammation, which in turn leads to osteoarthritis. The more obvious beginning of osteoarthritis occurs when the muscle spasms narrow the joint space and create pressure on the smooth cartilage that covers the ends of the bones. Jammed together by muscles in spasm, the joints swell and stiffen, restricting movement, and if this condition is not corrected, stress and friction make the once-smooth cartilage rough. Then, attempting to strengthen the area, the body deposits calcium on these rough and weakened bones. Over time the joint space narrows permanently, intensifying the pain from the ongoing friction, and degradation of the joint causes even more pain. Longstanding arthritis can eventually lead to joint deformity and permanent loss of movement. Finally, after years of agonizing pain, surgery (either to fuse the bones or to replace the joint) may become the last hope for a pain-free life. But it doesn’t have to be that way. In my own case, I was relieved when the doctor told me that my osteoarthritis had been detected early enough to be curable. He went on to suggest that I take the following steps immediately: find and stop the habitual repetitious position or action that was causing the muscle spasms; use gentle stretches to relax the muscles in my arm and shoulder and increase circulation; and take anti-inflammatory drugs for two weeks to reduce the swelling and pain. A previous yoga injury had already taught me that both gentle stretching and anti-inflammatory medicine would help improve circulation, reduce swelling, and promote healing. So of the doctor’s three recommendations, finding and eliminating the root of the problem became my prime objective. I was relieved when the doctor told me that my osteoarthritis had been detected early enough to be curable. Cloaked in a Sherlock Holmes mindset, I methodically searched my daily routines and habits. The habitual movement that was the source of my troubles was small, unconscious, and so ordinary that it took me a while to find it. But one day I caught myself using one arm to hold up the other while I talked on the phone. I was cocking my wrist, holding it fully flexed (with the fingers facing up) to support my other elbow. I also found that I was using this same body position for a variety of other tasks. And after adding up the amount of time my wrist was held in extreme flexion, just in the course of one day, I knew I had found the culprit. I knew that simply stopping the repetitive action would remove the cause and thus eventually reduce the inflammation and pain. But I wanted to speed up that long recovery time, so I adopted a holistic approach by putting into practice ideas and techniques that would strengthen my body’s healing process. I did so, with great success. 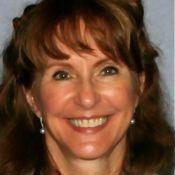 If you’re experiencing pain or have already been diagnosed with osteoarthritis, I hope you will find these ideas helpful. Natural anti-inflammatories can help reduce the swelling and relieve the pain: primrose or salmon oil gelcaps; ginger and garlic eaten raw or taken in capsules; and echinacea, goldenseal, red clover, feverfew, and yucca. Use anti-inflammatory and circulation-boosting spices such as turmeric, cinnamon, and ginger liberally in cooking. Massage the troubled areas with warm sesame oil, which is particularly soothing to arthritic joints. Try rubbing it on your body before you soak in a hot bath, and put some on at bedtime so it can penetrate into the joints while you sleep. Applying hot sesame or castor oil packs for 10–20 minutes will also get the soothing oil into your joints. What you consume throughout the course of each day will affect the course of osteoarthritis. Our bodies need a regular supply of water to restore and maintain health: at least eight glasses of water (preferably steam-distilled) plus juices and herbal teas. Our systems need three to five servings of fresh fruits (avoid citrus and tomatoes) and at least three servings daily of fresh vegetables (avoid green peppers, potatoes, and eggplant). Whole grains, which sustain the body’s energy levels, should make up 40–55 percent of each day’s caloric intake. Especially important foods to include in your diet are eggs, onions, asparagus, green leafy vegetables, brown rice, and fish. Avoid coffee and other forms of caffeine, red meat, sugar products, salt, all colas, white flour, tobacco, cayenne pepper, paprika, and junk food. Supplements may speed up healing time. Coenzyme Q10 increases tissue oxygenation and is important for connective tissue repair; a gluocosamine and chondroitin sulfate combination may help rebuild the cartilage. Vitamin supplements can also be helpful. Zinc and vitamin C with bioflavonoids both promote healing, control inflammation, and reduce swelling; vitamin E is a powerful antioxidant that aids in mobilizing joints; and B vitamins support healing. Eliminate iron from your vitamin supplements and consume it instead in molasses, broccoli, Brussels sprouts, cauliflower, fish, lima beans, and peas. Become a detective and search out the unconscious, repetitive movements and positions that may be causing your muscle spasms. Be aware of how you use your body, and identify when and where one group of muscles is being used repetitiously at the expense of its opposing set. Bloodflow is vital to the health of the muscles and joints. Rotate the affected joint every few hours at about 20 percent of its capability to increase bloodflow. Though these movements may seem too small to be effective, they are actually powerful healers. Gentle stretching will increase circulation, relieve strain, and decrease the tension routinely held in the muscles. They will also reestablish the normal range of motion, lost as a result of prolonged muscle spasms. Remember: Never challenge the joints or cause yourself pain as you stretch. Practice yoga poses. 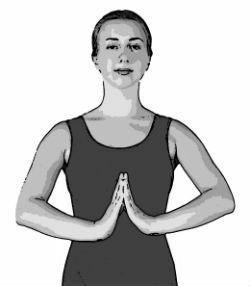 The following group of poses are examples of how to work with osteoarthritis in the hands, spine, or hips. All three of these modified poses can gently lessen the restrictions in the joints and reestablish a fuller range of motion. Take your time, work gently but persistently, and breathe. Stretching the hands creates space in the joints and increases circulation. Make sure the hands are warm before beginning. Work slowly and focus on gently moving crooked fingers and palms back to their normal positions. 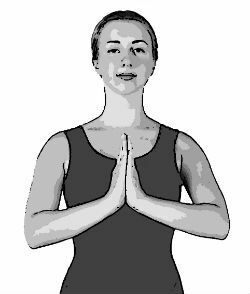 Level 1: Stand in mountain pose with the hands together and in front of the chest (in namaste or prayer position). If this position bothers the wrists, bring the forearms closer together. Inhale. Exhale as you gently press the fingers and palms together. Inhale and relax the shoulders back until only the fingertips are touching. Exhale and gently press the fingers and palms together again. Continue for one to two minutes, gradually increasing the pressure. Level 2: Begin with the same namaste position. Make sure the fingertips face the ceiling and the wrists face the floor, and inhale. Exhale, pressing the hands together. Hold the pressure as you gently pull the hands and wrists straight down. Keep pressing the fingers against each other as the palms gradually separate and open toward the floor. Lighten the pressure as you inhale, and increase the pressure as you exhale. Work slowly so that you stretch but never strain the joints. Creating bloodflow is the key to spinal health. This cat-stretch pose is excellent for increasing circulation throughout the entire spine. Keep the movement smooth and easy. It doesn’t matter whether you work at 20 or 100 percent of the spine’s original range of movement. All that matters is that you increase the circulation of blood to the spine. Kneel and place the hands directly under the shoulders and the knees directly below the hips. On each inhalation round the back like a cat, pushing it up toward the ceiling. 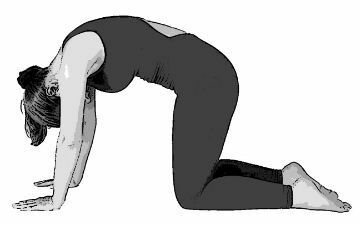 On each exhalation bring the spine down toward the floor (concave) as you lift the tailbone and head up. Continue moving with the breath for one to two minutes. Make sure you never touch the pain or strain the back. Note: If there are limitations in the use of the hands, wrists, or knees, try practicing this movement while standing up, placing your hands on a chair, table, or countertop. All the standing poses or modified versions of them are good for hip-joint health. When possible include a variety of them in your daily practice to strengthen and relax the muscles and realign the joints. Both virabhadrasana 1 and runner’s lunge are excellent for the hips. Here are two modified versions of the runner’s lunge position. Level 1: Start by finding a flight of five or more stairs. Place your right foot firmly on the floor. Lean forward and place the right hand on the fourth stair. 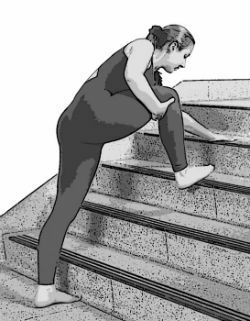 If you can, use the other hand to lift the left foot up to the third stair. 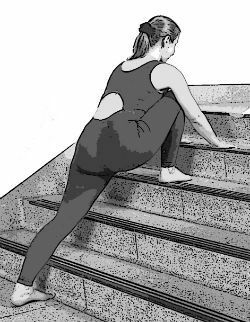 Then placing both hands on an upper stair, straighten the right leg and torso, tighten the right buttock, and move them in one straight line toward the stairs (bending the left knee) until the right leg touches. Lift the front hip bones up to increase the stretch in the thigh muscles. If possible, keep the right heel on the floor. Breathe and hold. Come down just the way you went into it and repeat on the other side. Note: This position is also good for the knees, as it provides relatively weightless full flexion. Level 2: Stand with the right side of the body beside a sofa, with the hands on the armrest. Bend the right knee and place the right knee, calf, and foot on the sofa seat. Step the left foot forward a few inches. Push the hands against the armrest and slide the right knee back along the sofa until you feel a good stretch of the right thigh. Keep the hips facing forward and the right leg as straight as possible. If needed, step the left foot forward even more to make a 90˚ angle of the left leg. Breathe and stretch. To switch to the other side, bend the right leg, sitting back onto the right foot. Pull the left foot in and stand up on it. Change sofa ends to repeat on the other side. All of the yoga asanas are good for keeping the body fluid, strong, and stretched. The key is not to overdo any pose and to work with full extension as much as possible. You do not have to live with pain, inflammation, and stiff joints the rest of your life, but you do have to take care of your body. Human beings now live longer than ever before in history, so use your body kindly and it will carry you the distance—pain-free. Make sure you warm up before practice and stay warm throughout your session. Practice in a heated room (72˚–76˚) or wear heavy clothing to hold in your body’s heat. Good alignment is vital for moving joints back into their proper position. Whenever possible, give each joint as much space and range of motion as possible. Take your time working your way into the pose. Focus on creating change rather than on how the pose looks. Although building strength is essential for decreasing joint fragility, it is unwise to try holding a pose for an extended period; instead, practice several short repetitions of each modified pose. Keep your breathing smooth, even, and full. Whenever the breath shortens or fluctuates, try a less demanding position.